The Little Kingfisher (Alcedo pusilla) was named for its small size, as it is the smallest Kingfisher species in the world. 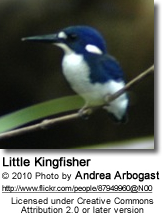 In Australia, the Little Kingfisher has a narrow range—the northern coastal areas of Queensland and the Northern Territory. It is an uncommon resident of coastal northeast Queensland and the Top End. 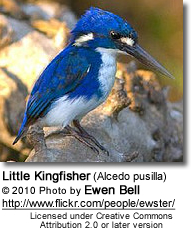 It is the smallest of all Kingfisher species found in Australia. It also inhabits Indonesia, Papua New Guinea and the Solomon Islands. The Little Kingfisher is typically found near rain forest pools, lakes, estuaries, in open forest, swamps, mangroves, creeks, and other waterways. This species tends to prefer dark, narrow spaces with overhanging vegetation. 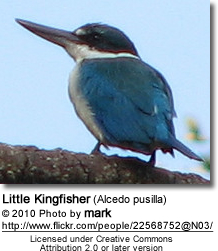 The Little Kingfisher is the smallest of all Kingfishers, measuring only 11 - 13 cm in length. The plumage (including the head) is deep glossy blue above extending down side of chest. The plumage below is white. It has a long, heavy, black bill with a white spot on each side of the neck. There is another white area near its eye. The legs and feet are black. It only has 3 toes, two of which point forward and one of which points back. During the breeding season (October to March in Australia), the Little Kingfisher will dig out a small burrow on the bank of a river. The nests are constructed by both males and females. They will take turns burrowing out a tunnel with their feet, and then they will hollow out a narrow chamber at the end of the tunnel in which to lay their eggs. The birds will spend between three and seven days working to complete their tunnel. Some birds attack their worksites so forcefully that they have fatally injured themselves as they fly into the tunnels during these excavations. The tunnels of the various species will reach different lengths, depending on their locations. If they burrow into termitarium nests, the tunnels will be shorter; nests built into the soil will be longer. Nests constructed in hard, less penetrable ground will have tunnels that are shorter than those dug into sand or soft soil. Kingfishers are fiercely territorial in defense of their nests. Nesting tunnels can reach 15 cm in length, and they will end in a nesting chamber, into which 4 - 7 glossy, white eggs are laid. Both parents incubate the eggs. The young develop quickly. After hatching, they are altricial (naked and completely helpless) and require feeding by the parents, who bring the food into the nesting chamber. However, soon the nestlings are able to travel toward the entrance of the tunnel where they encounter the adults and wait to be fed. Eventually, they are fed on a perch near the entrance. Fledging can last a few days to a few weeks. After that, the young will be on their own and are able to feed themselves. Both parents care for the young. The Little Kingfishers behave and feed in a similar manner to Azure Kingfishers. They will catch flying pray, such as insects, in the air. They will also dart from low branches to feed on small fish and crustaceans. They are specialists at diving deep into the water for their prey. They flight is quick and direct; and will often bob the head and wings in anticipation of spotting a fish. The Kingfisher will stab its prey, either with the bill closed or open, depending on the size of the prey. They kill their prey by beating them on the ground or perch to shatter the bones. Then they work the fish into their mouths, head first, so that they won’t get cut up by the bones or scales as they swallow it whole. They will even consume snakes in this manner! The Little Kingfisher's calls sound like thin, shrill whistles. These calls are higher pitched and weaker than those of the Azure Kingfisher, and are often inaudible to humans.